We arrived to the Indira Ghandi International Aiport in New Delhi around 2:00am. All international flights arrive around this hour because it’s easier to get into the city. We were met at the terminal by Mr Sunil Puri, the agent from Connexons, the touring agency we hired and our driver Mr Behandar Singh. It was dark and quiet as we drove past the colonial bungalos of old Delhi. Occasionally we’d see a few camels or a wondering cow, but no people. Everyone was asleep. So far the chaos of Delhi hadn’t revealed itself. Eventually we turned down a grand driveway into the Imperial Hotel, a grand Colonial Hotel built in 1934. It was one of the legendary “Four Maidens of the East” along with The Strand in Rangoon, Raffles in Singapore and the Great Eastern and Oriental in Calcutta. This is where Pandit Nehru, Mahatama Ghandi, Muhammad Ali Jinnah and Lord Mountbatten met to discuss the partition of India and Pakistan. It’s been maintained in perfect condition, including all the modernizations one could wish for after an all night flight restored. Our hotel room was over 800 sq ft of italian marble floors, burma teak and rosewood walls and furnishings and a marble bathroom larger than most new York City apartments. At 3:00am we checked in. We were totally tired but Mr Sunil Puri needed to go over our Itinerary; old and new Delhi, the medieval town of Mandawar in north Rajastan, the Pakistani border town Bikaner, the Blue city of Jodhpur , the lake city of Udaipur, the Pink City Jaipur, Agra and the Taj Mahal and a couple of days in Kathmandu, Nepal. All costs for hotels, tour guides, entrance fees to all monuments, boat excursions, elephant rides, air fares within India, and car with english speaking driver were included in the tour package. 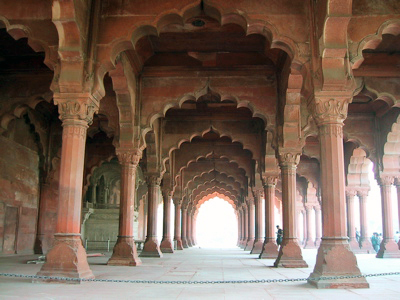 However, from the time we paid for the package to the time we arrived in Delhi, the government of India had raised the entrance price of the country’s most famous monuments. The visit to the Taj Mahal was now $35 a person for visitors, while still just a few rupee for Indian residents. Mr Sunil Puri was determined to have us sign the papers and pay him the extra $150 before he would hand over the cache of papers and entrance tickets. I asked if we could do all this later in the day. We just wanted to lie down and get some sleep. But Puri would not leave. He was afraid if he didn’t get it now, we might be gone later. I gladly paid him just to leave us alone. We got up around 12noon, had a sandwich a the hotel restaurant and went out to find a bank-o-mat. In most countries it’s easy to find an ATM machine. In New Delhi, it’s not. As soon as we left the protection of the Imperial Hotel, it hit us all at once; the smell, the colors, the noise. The gate opened and within the first three steps, they were on us like zombies to fresh meat, holding up racks of trinkets and shoving them into our faces. Old wooden shacks, barely able to stand up on their own were filled with clothing, beads, shoes, food and packages of beetle nut substitute that looked a lot like square condom packaging. We smiled and bowed and eventually made it through the bazaar to a very western collection of high rise buildings and the Citi corp Bank. We were flush with rupees, lots of em. Around 3:00pm Mr Singh arrived to take us on our firs day tour through Delhi. 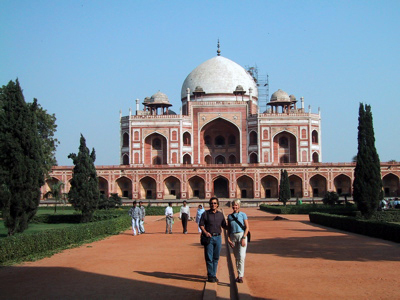 Our first stop was to the 16th Emperor Humayun’s Tomb (see photo above) built during the Mughal dynesty.This tomb was used as the prototype for the architectural design of the Taj Mahal. Our next stop was the 12th century Qutab Minar. 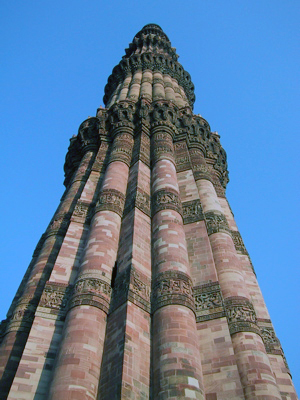 At 72.5 metres high (237.8 ft) it is the tallest minartet in all of India and the talles brick minaret in the world. It takes 399 steps to get to the top, but it was closed to the public; apparently too many stampedes during holy days. 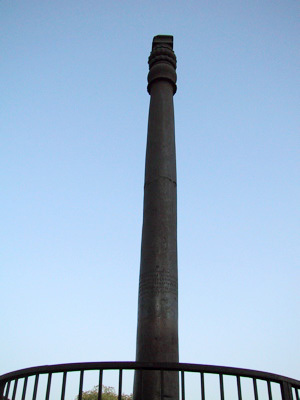 In the center of the ancient ruins of the Quwwa tul Mosque is the 4th century Iron Pillar. There is an inscription on it that states it was dedicated to the god, Vishnu, and the memory of the Gupta King Chandragupta II (375-413). No one knows how the pillar go there but it’s an amazing achievement in metallurgy. 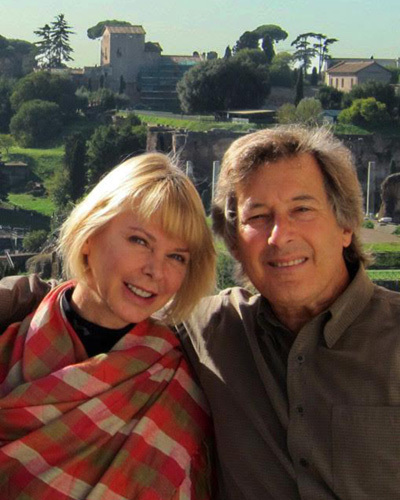 It’s made of 98% wrought iron and has gone over 1,600 years outdoors without rusting or decomposing. The National Museum was closed and so we took a ride through the grand boulevard of New Delhi, to India Gate, a large Arch de Triomphe like gate built in 1931 to commemorate the Indian soldiers who died in the World War I and the Afghan Wars. From there we drove by the Parliament House and the Presidential Palace. We also made a stop to visit the Ghandi Memorial. This very moving tribute to a very great man is situated in a very peaceful park overlooking the Yamuna river. It was originally just the tomb of Mahatma Ghandi, but since his death, it has also become the burial site for Jawaharlal Nehru, Indira Gandhi and Rajiv Gandhi. We got our first taste of the driving skills of Mr Behandar Singh; fearless. To drive slow in India is a giveaway to the other drivers that you are a wimp and they’ll run you off the road. Driving is an offensive sport here. Most trucks and carts carry wear a sign that reads “horn, please” and it is strongly advisable to blast the claxon when a car is coming, when making a turn, or when you think something is about to happen. Turn on your left turn signal, beep the horn three times. Turn on the right signal, beep three times. There are so many horns going off in New Delhi, all sizes and all tones. Sometimes it gets difficult to figure our which one is yours. Traffic is pretty scary, mostly because we can’t figure out who has the right of way. I think cows, elephants, camels, trucks and buses has precedence over passenger cars. 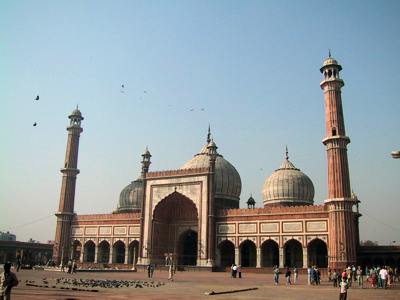 Today saw the 17th century Mughal Mosque of Jama Masaid, the oldes Mosque in India. The floor is covered with ornamented black and white marble tiles that give them impression of being Muslim prayer rugs. The courtyard behin the Mosque is enormous.Our guide, Vijay, told could hold over 25,000 people.